2017 will be very crucial year for Samsung for the Mobile market. Although the business has grown in the past year for Samsung, but the reputation which Samsung lost because of the fail of Note 7 has to be regained and Samsung Galaxy S8 will play a key role in that. As the common practice, leaks are out about the new and upcoming Samsung Galaxy S8. An image has been leaked by the Chinese website weibo, claiming the device as Samsung new flagship. The image comes from /Leaks, and shows a smartphone in a chromed gold finish that looks very similar to the existing Galaxy S7 edge at first glance. The image has been sourced from a Weibo account indicating that smartphone may be undergoing testing in China. Upon looking closer, one can notice how much bigger the display has grown and spread out over the front face of the device. While the dual edge curves look no different from the existing S7 edge, the top and bottom bezels have shrunk by a huge margin, so much so, that there’s no place for the usual home button at the bottom. However, there is another detail missing and this would be the navigation keys. While the set up at the top end looks identical to the S7 edge, the bottom end simply shows the Samsung logo. If this leaked image does turn out to be genuine and not some good photoshop, Samsung could have placed an ultrasonic fingerprint reader below the logo in the chin. The navigation keys could be hidden at a software level either in Samsung’s Grace UX or may simply be hidden on either side of the Samsung logo as capacitive keys that light up on touch. What isn't clear from either picture is the size of the screen. 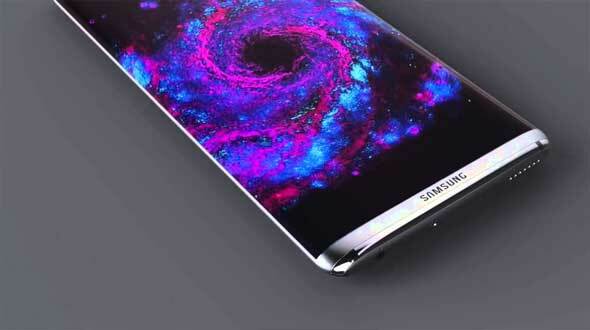 There have been several conflicting reports as to what screen the Galaxy S8 will come with. Some say there will be two phones with 5.7-inch and 6.2-inch screens, yet other rumors say there will be just one Galaxy S8 released. It's highly likely the screen featured in the leaked images is indeed bigger than the 5.5-inch display of the Galaxy S7 edge, especially now there's no physical home button to contend with. As for when we will see the Galaxy S8 officially unveiled remains up in the air. Fingers were initially pointing to an unveiling at Mobile World Congress at the end of February, but it now seems more likely that Samsung will hold its own event, possibly in New York on 18 April.